Samir Chopra asked for a stats post on "mini-orders", and here it is. A mini-order is defined, for this post, as a block of three players at the same positions in the batting order. So, for instance, you could have Langer-Hayden-Ponting as a mini-order (with positions 1, 2, and 3). Now, I could fill up pages with the various possibilities (123, 345, 456, 567, etc. ), but that seems like it might be excessive. So below I've listed the leading mini-orders by runs scored. This is, of course, a list heavily biased towards recent teams. In the table below, the columns are the number of team innings in which the triple appeared; total runs made in those innings by the batsmen in that mini-order; their average in those innings; the number of runs made in partnerships between those three batsmen in those innings; and the average of those partnerships, adjusted for era and quality of the bowling (relative to an overall average of 31.5). The regular average and partnership average are typically close to each other. The partnership stats are not complete, since I ignore any team innings which look like they involved a retired hurt. Note that the order is strict — Langer-Hayden-Ponting is considered separately from Hayden-Langer-Ponting. The latter only happened twice, by my count. If you ignore order, then Taylor-Slater-Boon would go into fifth place. Taylor and Slater alternated almost perfectly in which of the two faced the first ball. The constancy of the Australian batting lineup in recent years is well-known, of course, so it's perhaps no surprise to see that the Langer-Hayden-Ponting trio has appeared in more innings in that order than any other. Even allowing for the high scoring these days, they come out easily better than Greenidge-Haynes-Richardson. I started thinking about this as I started working my way through The Book: Playing the Percentages in Baseball (the authors blog here), trying to pick out the bits which can carry over to cricket, so that we don't have to re-invent wheels that the baseballers have already made for us. One key point that they make is that a player's raw statistics aren't the best estimates of his true talent — you have to regress to the mean. The less reliable the stat, the more you regress. The less data you have, the more you regress. (And vice versa.) We know this intuitively in some cases — much though I love him, no-one really thinks that Mike Hussey is an 80-average batsman, and indeed in the West Indies his average has dropped to below 70. But the question is, how many innings does a batsman have to bat before we can be confident that his average is accurately reflecting his talent (and not have to worry about regressing to the mean)? The short answer appears to be something on the order of 10000 innings, if we want to nail the average down to within a run or so. That's an appallingly large number of innings, completely counter-intuitive for me. Averages seem to stabilise for batsmen after a hundred innings or so. But that intuition we have is based on the wrong thing. Career averages are stable because subsequent innings can't change the overall average much. A better way of thinking is, what would happen if the player re-ran his career from the start (so same opponents, etc.) but with different luck? Here, luck could be things like balls that beat the bat actually finding the edge (or vice versa), dropped catches, etc. At this point I still would have thought that over a couple of hundred innings, you'd get the same average, to within a run. But the numbers are telling me different things. To take an artificial example, suppose that a batsman's scores are exponentially distributed with mean 50, and no not-outs. I ran a few simulations of such a batsman over 300 innings, and here are the sample means that came out: 51.8, 54.4, 47.1, 48.4, 50.1. That's quite a wide range, even for a longer career than any in Test history. At 47.1, you're talking about a very good batsman. At 54.4, he's an all-time great (perhaps not in today's batting-friendly world). In practice, we would expect that it would be even worse than this, because batting scores are not exponentially distributed — the standard deviation for real cricket scores tends to be higher than for exponential scores. So now let's look at some real cricket scores. The way I'll do this is to take a player, and compare one half of his career to the other. Now, you can't take the first half and second half of the career, because there might be a change in talent over that time (developing better technique, losing reflexes, etc.). So instead, I split the innings into odds and evens (further splitting by first and second innings in matches — I didn't do this perfectly, but it should be close enough). This way, any genuine slumps or good years will be split evenly into the two halves for comparison. Allan Border in his 'even' innings (132 of them) averaged 49.5, and averaged 51.6 in his 133 odd innings. That's not too bad, I suppose. The two are pretty close together. But what about Steve Waugh, who was almost as prolific in terms of innings? Evens 55.9, odds 46.3. Tendulkar: evens 52.6, odds 58.0. Viv Richards: evens 66.1, odds 36.5. Those are some hefty differences (Richards' being one of the most striking). 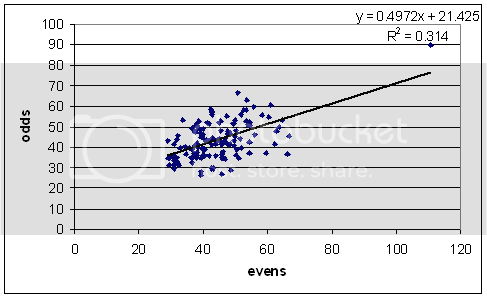 Here is a plot of the odds average against the evens average for all batsmen who played 50 or more Tests and averaged at least 30. That R-squared value drops even further (to 0.18) if you remove Bradman. 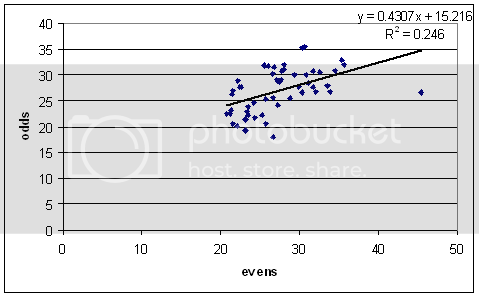 If there were no luck at all involved, then R-squared would be 1, and the dots would make a nice little y = x line. Cricket is a lot more luck-filled than that. We would like some kind of estimate of the uncertainty involved in batting averages. As we see from the graph above, they'll be pretty big. I'm not entirely sure if what I did was the best way of doing things, so if any stat-heads amongst you can suggest improvements, please do. So, we can use this to estimate the uncertainty over whole careers, by 1.7 * avg / sqrt(innings). Even for a career as long as Border's, that gives an uncertainty of about +/- 5.3 runs. Mike Hussey comes out to 68.4 +/- 17.9. Now in Hussey's case, we'd lean much more towards the lower part of that estimated range — he's not an 85-average batsman. Why do we think that? Because only one man in history has been that good, and no-one else has ever got close. It's much more likely that Hussey is like everyone else than he's like Bradman. To make estimates of this sort more rigorous, we need to know the distribution of the batsmen that Hussey is a part of. This won't be the overall mean and standard deviation of averages across all Test batsmen, because clearly the talent pool in Australia is much stronger than in Bangladesh. Probably what I'll do is use my adjusted averages and work by country (and possibly era — the standard deviation of averages is on a slow historical decline). But this will be for a later post. The uncertainties I make to be about 1.7 * avg / sqrt(wickets). Warne (for instance) becomes 25.5 +/- 1.6. Homer broke down Michael Clarke's innings to see what happened when he came in with the score less than 150, and when he came in with the score greater than or equal to 150. Clarke does much better when the going's easy. But that's not a proof that Clarke is special — we would expect that batsmen do better when the bowlers have been struggling to take wickets. So ran the numbers for all batsmen at 5 or 6. I grouped the innings into those worse than 3/150 or 4/200 (these seem reasonably equivalent), and those better. Then I took the difference of the averages. Then, to get some mileage out of this old monstrosity post of mine, I got an estimate of the probability that the "going's easy" average would arise by chance, given the "going's not easy" average, and the number of innings in each category. To give an example, Michael Clarke below gets a p-value of 0,20 — only about one in five batsmen would have such a rise in average. If there's an asterisk, then it means that the difference was too large for my estimation algorithm, and I got a senseless result. Note that many of the batsmen below spent much of their career higher up the order. Also note that my stats are a couple of months out of date. Clarke really has been pretty bad (well, sort of — 37,1 is below average). In terms of the raw difference, he's fifth worst (Les Ames is just off this table, difference of -37,3.). When the p-value is higher than 0,5, it means that such a 'slump' would occur in the career of one in two batsmen — pretty unremarkable. Clive Lloyd's record is probably the most remarkable of these, given the relatively large number of innings. In the set of 83 players, 52 have better averages in easy situations, and 31 in not-easy situations. Sorry for the no-post last weekend. The problem with devoting only one day a week to cricket stats is that if I don't get something working, then it doesn't get done for a while. I will try to return to IPL analysis next weekend.